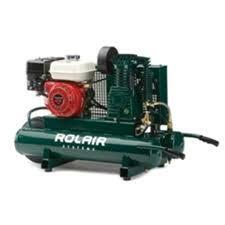 ROLAIR SYSTEMS 5.5 HP Honda, 8.9 CFM@100 PSI, 9 Gallon Twin Tank, Belt Drive, Splash Lubricated. The 5.5 HP Gas wheelbarrow has long been the top choice of framing and roofing contractors. In this class, the 4090HK17 stands out because of its high CFM output, portability and rugged build. Delivering 8.9 CFM at 100 PSI this unit incorporates the popular 5.5 HP Honda engine with automatic idle-down, for increased fuel efficiency, and an atmospheric unloading system to prevent oil consumption. * Please call us for any questions on our air compressor 5.5hp gas 8.7 cfm 90 rentals in Eden Prairie Minnesota, Bloomington, Chanhassen, Minnetonka and surrounding Twin Cities communities.